That’s the tongue-in-cheek messaging Jill Piebiak and Kathleen Fraser have packed into a petition calling for Canadian tax law to reclassify tampons as “essential” medical devices like contact lenses or adult diapers. The campaign supports NDP MP Irene Mathyssen’s private member’s bill to drop GST on all things “that time of the month.” Since January, the petition has amassed over 50,000 online signatures, fuelling similar debate in France, the U.K. and Australia. While it may read like a fun ad parody, the petition points to a serious barrier for low-income women. The Winnipeg Free Press recently ran a story about a local food bank receiving 6,909 requests for menstrual products, with only 125 of them filled. The government doesn’t charge federal sales tax on goods and services deemed “essential.” Houses, groceries and medical items already fall under this category. A growing listof Canadians agree the definition should include tampons, pads and other menstrual hygiene products — but tabling the idea in Parliament has proven no easy task. The Tyee reached Piebiak and Fraser via Skype to chat about the challenges they face getting Stephen Harper to talk about periods. Greetings fellow menstruators. How did you first get acquainted with Canada’s list of “essential” tax-exempt products? Essentials such as basic groceries and assistive medical products are supposed to be GST-free. What other kinds of products are exempt? 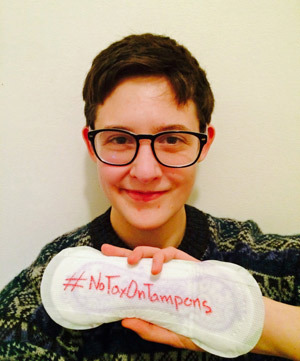 You’ve made a playful case against taxing menstrual products. Was having fun always on the agenda? How much is it costing Canadians to menstruate? You posted the petition in January, and so far it’s received 52,000 signatures. Was this the response you expected? What are some of the misconceptions you’ve encountered in explaining this project? If you could directly respond to somebody who says you’re asking for a frivolous freebie, what would you say? You’re now asking folks to print and send hardcopy signatures to Irene Mathyssen’s office. What’s that about? What do you think Stephen Harper would say?